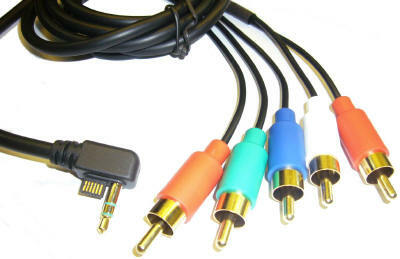 Overview : PSP Slim 2000 Series Component Cable allows to display videos, photos and play music as well as games on TV. Suitable only for the new Slim Series (PSP-200X). Allow to display videos, photos and play music as well as games on TV. For playing games, a TV which supports progressive scan is required. Quality/Usability : DragonPlus has entered the PSP Slim scene with their own Component Cable. DragonPlus is well-known for their 3rd party peripheral in the videogame industry. Like majority of DragonPlus products, the quality of the cables are sturdy. The biggest complaint about the PSP's video-out feature is that in order to play games, you'll need a TV that has progressive scan. If you dont have a progressive scan compatible TV, you'll be left with only looking at videos and photos. Once you have selected the PSP's output setting, the image displayed on the TV does not fill it completely but is bigger than we expected. On my 32-inch LCD, it measured approximately 22-inches. This seems to be how the PSP outputs as another PSP Slim component cable that was reviewed also has the same result. Images were a little washed out compared to the screen on the PSP screen but the images were still viewable and clear. There were jaggies but this is expected since you're taking a small image and stretching it to fit the screen. Conclusion : Overall, the PSP Slim 2000 Series Component Cable worked well. There wasnt any big complaints except for the minor washed out colors and the noticeable jaggies was expected since you're scaling up an image. For $10.00, the price was very reasonable. There is also a video showing the XCM 1080p VGA Box allowing you to hook up the PSP Slim component cable and be able to play on a VGA monitor. You can read the news here and our full review on the XCM 1080p VGA box here. Guests online: 475. Total online: 475.